Once again, I am in shock at how quickly time is passing. Most exciting, June finally has a little bit of hair! Shoes are by Isabooties. 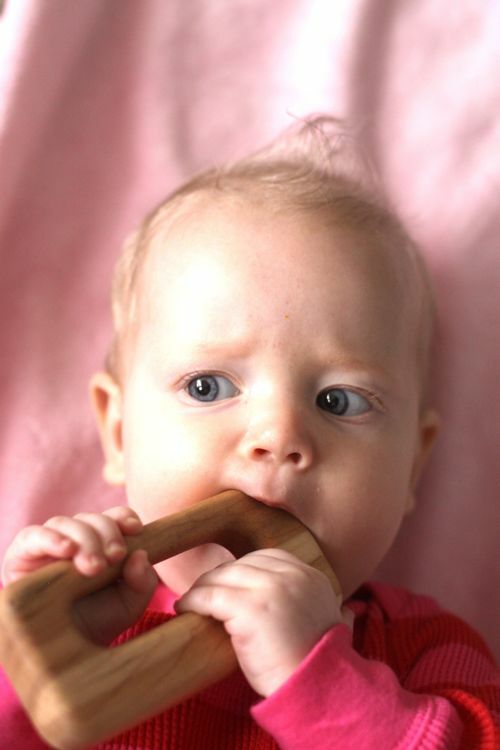 Wood teether rattle by Little Alouette. Stripey outfit from Old Navy. I just love a baby in stripes. A-door-bell! So cute- happy 7 month! what a beautiful baby! those eyes are captivating! She’s so precious :) Funny how babies can go from wide-eyed to passed out. just. like. that. What a sweet girl! Time does fly; my little girl will be 9 mos on Friday. Congrats! Happy 7 months, sweet baby June! You are beautiful! My baby girl will be 6 months in a few weeks. Time passes so fast, especially with older sibs. The golden age of baby-hood! I love it – she’d so precious. happy seven months! she looks good in stripes, what a cutie pie. Look at her!!! Another beauty! She knows she’s loved. i have to tell you, she is one of the cutest babies i have ever seen. her eyes are gorgeous! she’s gorgeous and I love that you share the monthly updates! She’s adorable. Isn’t it wonderful how you can enjoy #6 so much more knowing how fast they grow. She is adorable, Blair! Happy 7 months birthday, June! 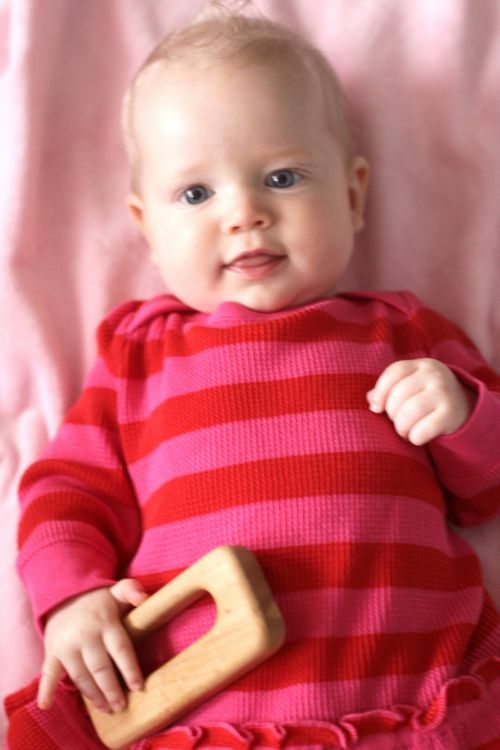 My baby girl turned eight months yesterday:) They are growing up so quickly! Pretty baby June can have the moon! Oh the days of the mid-morning nap. I long for them sometimes when 1.00 seems like years away. She is SOOOOOO cute! She is completely adorable – really starting to see a family resemblance – love that! june is truly a beautiful girl. happy 7 months! Wow. I knew we were close on delivery dates. I had a boy on April 30 but he was due May 7th! Small world huh?! Its so fun to see your little one. I am curious to know her “stats” it’s fun to compare. I bet my little guy has her beat in the diaper for sure. Kinda embarassed to say he’s in size 5 and movin up!! Oh my heavens, she is adorable. She is so beautiful! I can’t believe she is already 7 months. Time flies!! I noticed her hair before I read your comment . Beautiful hair – beautiful baby. I really admire that having five others and all that you do that you take the time to stop and smell the roses…..they grow up so fast!!! I struggle keeping up with two….you are an inspiration!!! She has changed a LOT this month! Thank you for the eye candy today. baby june steals my heart every time i see that cherubic face. with five older siblings, i bet she needs her naps just to keep up with all the excitement in your home! I noticed her hair right away it’s so blonde and pretty – such a sweet baby! WOW time sure is flying.. she is such a sweetie! how you work it all in amazes me. She is so cute and sweet! She looks just like the rest of the family! 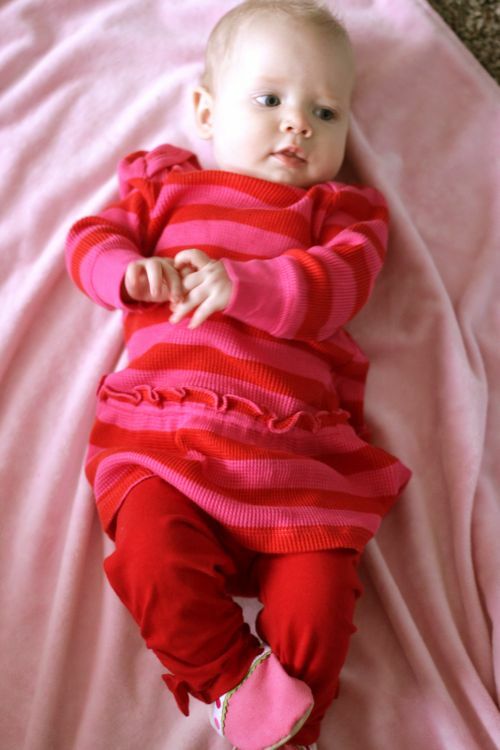 She looks as scrumptious as a candy cane in that red and pink striped outfit. I love it!! Enjoy every moment…I know how time flies too quickly. I love baby June! What a precious baby sister! She is beautiful! It’s starting to hit me that number 2 will be here in 10 weeks or less…how you have raised such a big (and adorable) brood never ceases to amaze me! Och, if you could only take that moment and bottle it up! She’s so cuddly and sweet…and have I mentioned I love her name? 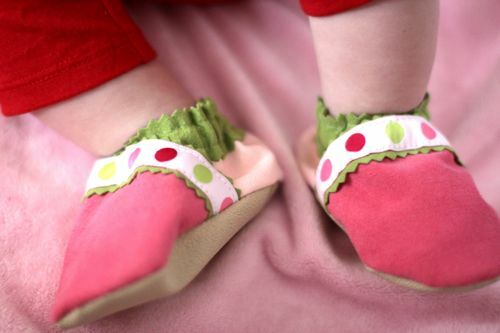 Also – those shoes are adorable. She is darling, and so petite!! My little boy thinks the diaper size should coincide with his age…..in months. He was 4 months old on Thanksgiving.